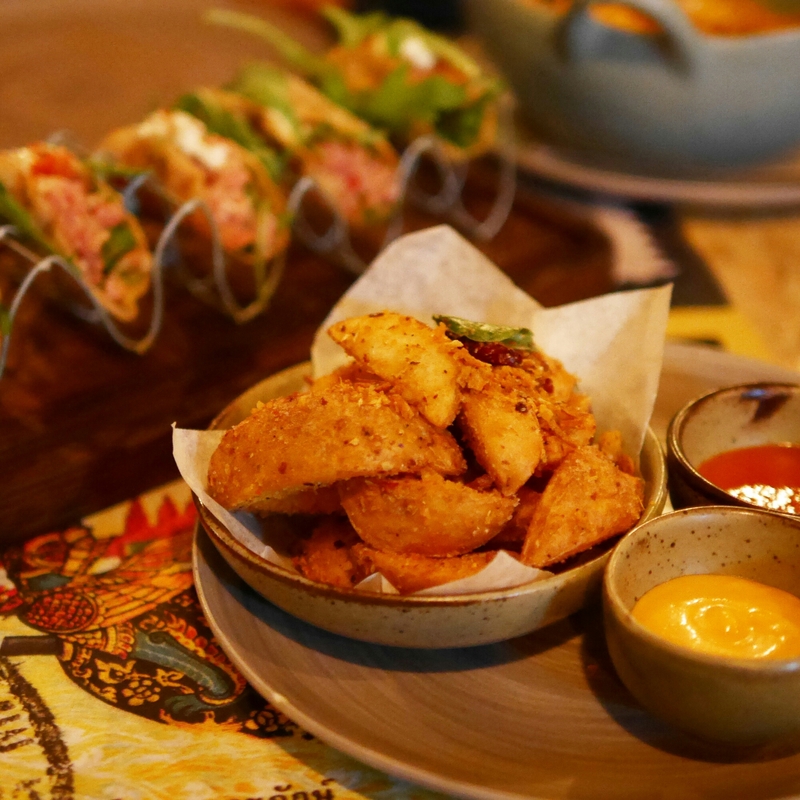 Soi 7 has replaced Koh Thai among the busy bars of Wyndham street. But apart from being Thai, there’s little reason to associate the two with eachother. Soi 7 is much hipper, better and serves fusion Thai. In fact, I came here for the second time in less than a week! The taste of the food is usually priority. But if you’re dining out for an occasion or with a larger group of friends, the environment does matter. There’s nothing more awkward or turning off than a too-formal, too-quiet restaurant when you’re with a group of chatty giggly girls, or one where the music is too loud to even chat. This place is laid back, kind of dark (they always are nowadays) and not too noisy either. Our dinner got off to a really good start with the tuna tartare taco – this must have been my favourite or second favourite dish I had. 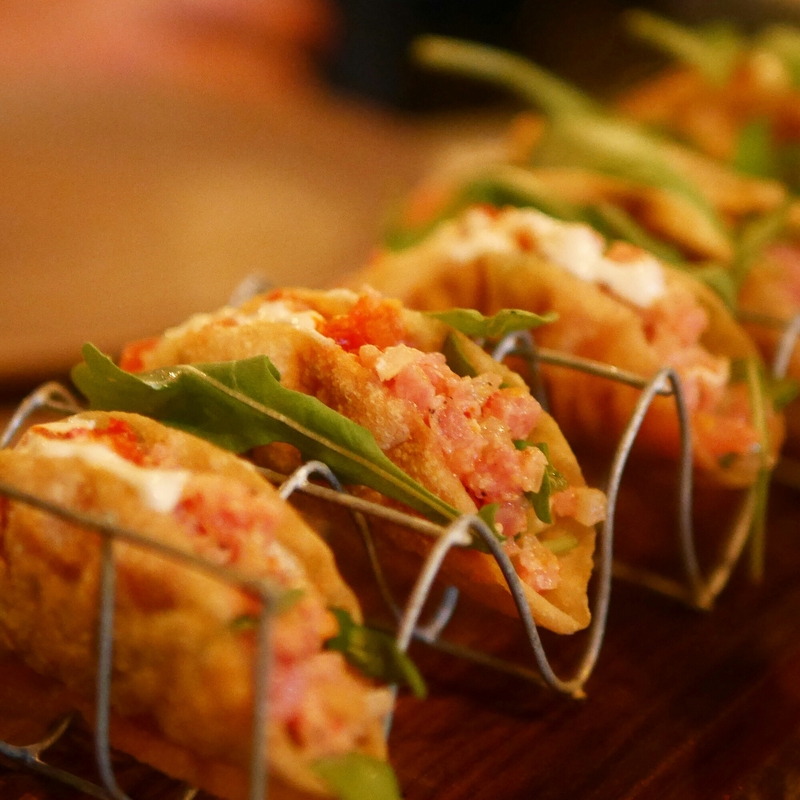 The raw tuna was delicious, mixed with aromatic Thai herbs and spices and placed inside a thin crispy wonton shell. Plus I liked that they weren’t stingy with portions either – one order came with five. If it wasn’t the tuna taco, the spicy shrimp would be my number one. 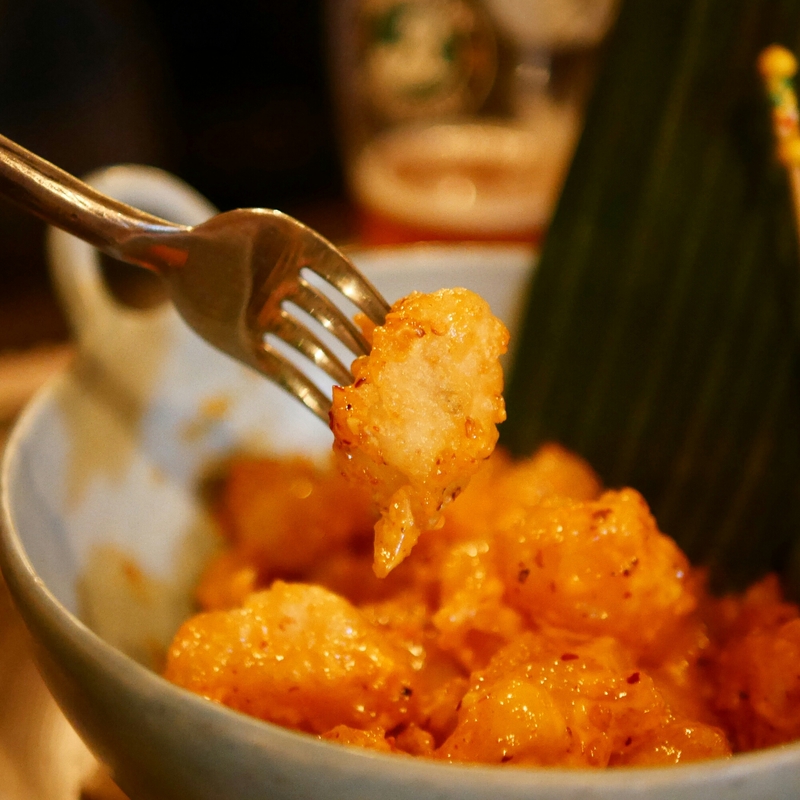 The medium sized shrimps were deep fried in not-too-thick tempura batter and mixed with a spicy Sriracha aioli. So addictive! After the first two dishes, I was really a fan of this place (they were so good that I ordered them again when I came back less than one week later). But the lobster pad thai was a let down. The pad thai itself was decent and I would have probably been pretty content if it came alone. 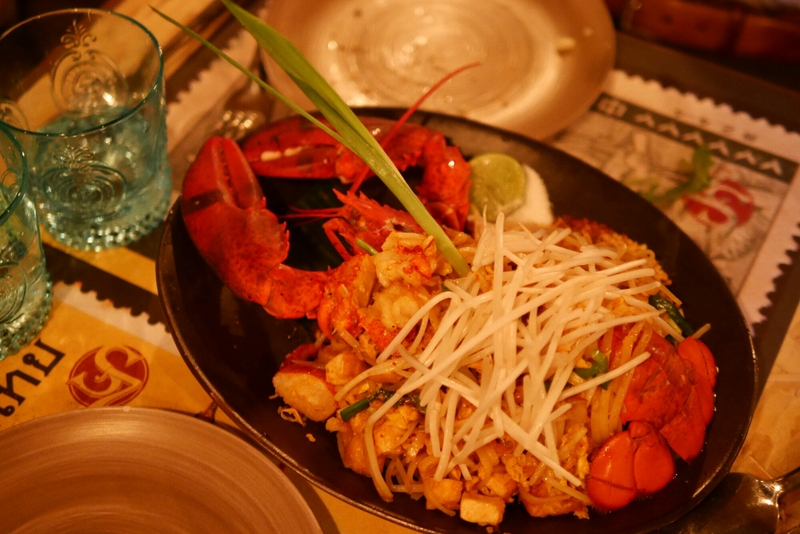 But they obviously hyped up this dish with an epic lobster and hence charge HK$298 for the dish (when pad thai should really just be HK$78-98). The lobster was quite tasteless and there were less than 5 bites of it. Plus, no lobster taste was incorporated into the noodles. Definitely an encore item if you’re more than two! They are essentially potato wedges which are quite spicy – don’t underestimate the spice. These fries made me pause for 10 minutes at one point to down iced water. Another addictive great choice for the spice cravers. The dessert part was a bit sad. I was annoyed that I had to wait over 20 minutes. 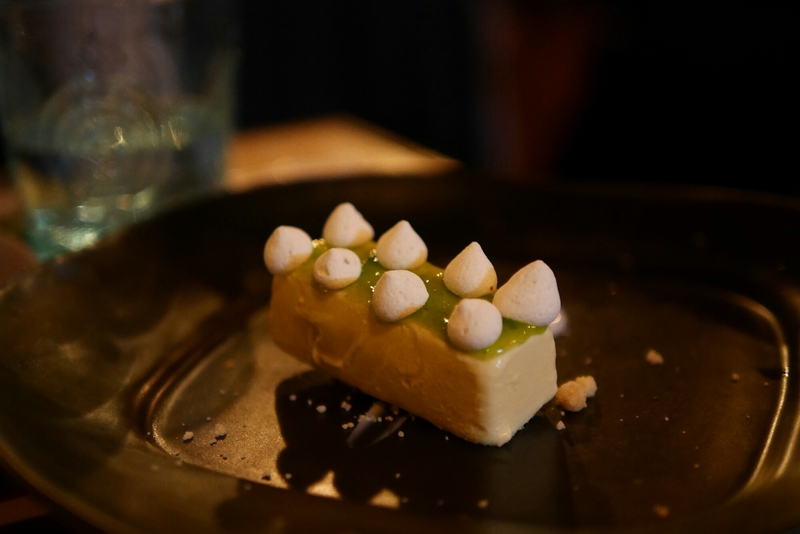 It tasted quite good I’d say – kind of like a key lime pie, but a little more refreshing and light. But then the bill came and I saw that it costs HK$88… I am actually quite open to pay for desserts, they sometimes even cost over HK$100, but it just makes me resentful when restaurants are so stingy with the portions. The size of it was tiny! Ok, so the dessert affair did not leave me a happy customer after my first visit. In spite of that, I recommended the restaurant to my friends for a group gathering, less than one week later. So you could say I kind of love it. They also had some pretty good vegetariano options I discovered on my second visit, such as the eggplant and vegetarian curry.